The Daily Mirror visited the Los Angeles Police Historical Society on Saturday and stopped in at the Black Dahlia exhibit. Not all of the material on display is terribly relevant – although the items on Woody Guthrie are worth a look if only to see who was considered a possible suspect. Photo: Elizabeth Short and a poster reading “Elvira” on display at the Los Angeles Police Historical Society. One display features a page from an interview with an unidentified man from Boise, Idaho, who told detectives about his experiences with Elizabeth Short in Long Beach, where she stayed from late July to early August 1946. Photo: Elizabeth Short and a temple dog, on display at the Los Angeles Police Historical Society. the room we saw this girl going down the stairs. She was ahead of us and we went across the street to breakfast at the drugstore. She was a nice-looking girl and smiled at us and we had breakfast together in the drugstore and then we went back to the room and then went to the beach. I don’t know where she went. And then we would have breakfast with her every morning and walked to the beach a couple of times in the afternoon. One night she said she would like to go to the Palladium dancing and we got the P.E. train and went to Hollywood in the afternoon and spent the day dancing and came back that night and probably got home about 2:30 or 3:00. That must have been in July or August, I guess. It’s hard, you know, when you don’t know exactly the months. Q. That would be in ’46? A. Yes, that would be in ’46 because I got out in May — April — June –well, I was home a month and a half or two months and run into this buddy and decided to make this trip. Anyhow I went out with her a couple of times. She was a beautiful girl and well built and seemed like a nice girl. 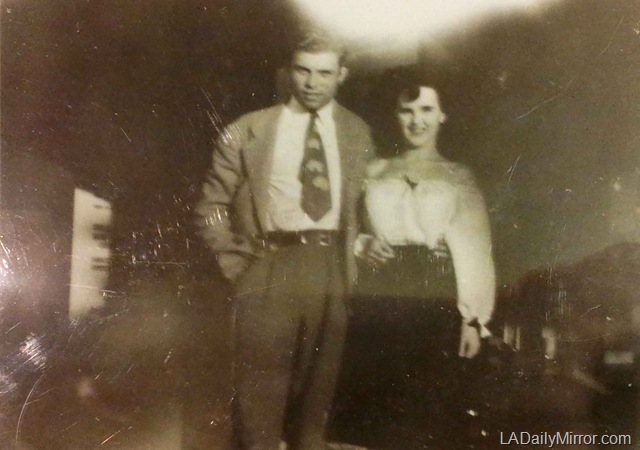 Photo: Elizabeth Short … in Studio City? at the Los Angeles Police Historical Society. Q. Where were the other places you took her besides the Palladium. Photo: Elizabeth Short outside Earl Carroll’s, on display at the Los Angeles Police Historical Society. This entry was posted in 1946, Black Dahlia, Film, Hollywood, LAPD, Museums and tagged black dahlia, Elizabeth Short, lapd. Bookmark the permalink. In the 2nd to last photo, Elizabeth is standing in front NBC Radio City studios on the NE corner of Sunset/Vine in Hollywood. The poster must be from the 1943 Swedish film Elvira Madigan–playing at an L.A. art house a few years after its release? Sure wish I could figure out the theatre she is standing in front of. The other photo of her and “a temple dog” is her standing in front of the statue at the left side of the entrance to Grauman’s Chinese theatre. I mentioned this below, but figured I’d reply to this thread also… but any chance she’s in front of Tom Breneman’s in that second pic of her? The circular logo in the center looks like one of the words ends with “man.” Also, he had a character in the show named Elvira Spriggens. Not sure how that would relate to the second word though, looks like maybe she’s covering up part of the sign. Thanks Larry. That is so cool to be able to attend that event. Can’t get enough of Elizabeth Short, bless her heart. Larry, You finally got over to the museum. @Sam: I did. And I’m going back! The NBC studio complex at Sunset and Vine was called “Radio City” so considering where the other photos were snapped, that’s where she was, not Studio City. @Tony: That was my hunch because I knew she frequented Columbia Square. The unidentified man’s name was Robert Robertson. Not to be confused with the 1950 Ohio murder victim of the same name. He was just an ex-serviceman from Boise, Idaho, who happened to be visiting SoCal. Temple dog is identical to ones in forecourt of Grauman’s Chinese Theater. Also seems unlikely that Short is posing in front of a poster for 1943 version of Elvira Madigan, as the letter just before “GAN” would have to be an “I” and instead appears to be much larger letter with semi-open center, such as an “O”. Any chance she’s in front of Tom Breneman’s in that second pic of her? The circular logo in the center looks like one of the words ends with “man.” Also, he had a character in the show named Elvira Spriggens. Not sure how that would relate to these second word though, looks like maybe she’s covering up part of the sign. I am blown away by these pics. Every now and then I troll to see if there is anything new on Elizabeth. The second one is the most fascinating to me. A very candid shot. I have never seen one of her where she was not posing. I have to get to LA to see this exhibit. Definitely a poster for Elvira Pagan in my opinion. The wording on many posters is centered within its borders. If you look at the “A” in the word Elvira, you will see that only the “N” in the lower word extends out from it. Assuming the writing on the poster is in fact centered, there should only be one letter of the lower word extending out to the left of the “E” in Elvira. Elvira Pagan, I would say.